Four o'clocks (Mirabilis jalapa) are bushy flowering perennial plants, a long-standing garden favorite often grown as an annual outside its hardiness range (zones 9 to 11). This tuberous-rooted plant produces opposite, slightly pointed oval leaves on multi-branching stems. It is an unusual plant, in that it may produce flowers of different colors on the same plant—including white, yellow, and a variety of pink, red, and magenta colors. Individual flowers may also feature a mixture of colors. The plant can be expected to bloom from mid-summer all the way until frost. The 2-inch-long flowers have five petals and are trumpet-shaped; they typically bloom in the late afternoon, from about 4:00 to 8:00 pm, although on cloudy days they may not bloom at all. This quick-growing plant often sprawls in the garden. It is often used in mixed border gardens, or in containers on decks and patios. Since four o'clocks bloom in the evening, plant them where you’re sure to see them and catch a whiff of their fragrance. Place pots on decks or plant along walkways and on the edges of seating areas. They mingle and grow through other plants nicely, making a nice underplanting. Hummingbirds will visit your garden because they are attracted to four o' clock's tubular flowers. Four o'clocks can be directly seeded into the garden, or planted from nursery seedlings or tubers. If planting from seeds, sow them in the garden 1/4 inch deep just before the last frost. Seedlings or tubers can be planted just after last frost. Plant them in just about any soil type, in a full sun to part shade location. Space them 1 to 2 feet apart. They are heavy feeders, so rich, humusy soil is best; expect to feed them regularly in less ideal soils. Keep four o'clocks moist. Mulch around the plants, to keep the soil moist and the plants blooming. Feeding with an all-purpose fertilizer once a month will keep them blooming profusely. After the plant is done blooming in fall, the tuberous roots can be dug up and stored for winter, then replanted the following spring. Four o' clocks thrive in full sun (6 hours per day) but will tolerate part shade, although the plants may be somewhat leggy in shady locations. Any soil types will suffice, but rich, humusy soil is ideal. The plant prefers neutral to slightly acidic pH levels. Do not let these plants dry out; water whenever the top 1 to 2 inches of soil becomes dry. Mirabilis jalapa is native to Peru, and it prefers warm but relatively dry air conditions, but moist soil. A monthly application of organic fertilizer will keep four o'clocks blooming vigorously. Less robust soils may require more frequent feeding. Mirabilis jalapa mix are old-fashioned self-seeding four o’clocks in mixed solid colors. Mirabilis jalapa 'Alba' is a white variety that freely self-seeds. Mirabilis jalapa 'Jingles' cultivars are smaller plants with two-tone and multi-colored flowers. Mirabilis jalapa 'Kaleidoscope' is a hybrid with multi-colored pink, yellow and white blooms. The roots and seeds of four o' clocks are mildly toxic, causing skin irritation through contact, and stomach pain, nausea, vomiting, and diarrhea if ingested. Both humans and animals can be affected, though fatalities are almost unknown. Treatment is usually not necessary, but it is a good idea to keep children and pets away from these plants. Pinch back the main shoot when the transplant is young to promote a bushier plant and more flowering. In drier seasons, when the plants can get a little ragged looking, a shearing back by about 1/3 will refresh them. Because four o’ clocks bloom so profusely, keeping them deadheaded is all but impossible, and they don’t really need it to keep blooming. When planted in containers, four o' clocks require a large pot filled with general-purpose potting soil (not garden soil). Plants in containers will need more frequent watering and feeding than those in the garden. Feed twice monthly with a balanced 10-10-10 fertilizer. 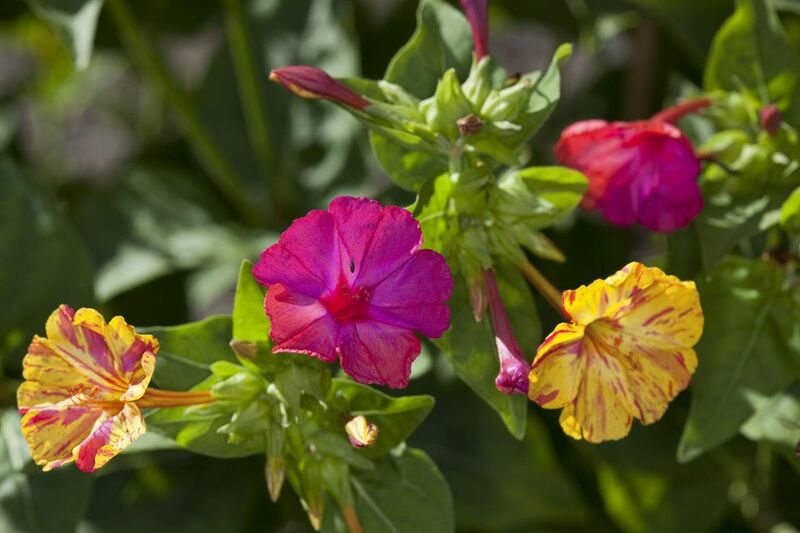 Four o' clocks tend to be very pest and disease resistant. However, rusts, (white rust and brown rust) and some leaf spot diseases can affect the foliage. On a positive note, some reports claim that the leaves are both attractive and lethal to Japanese beetles.